Paul Patterson has had a long relationship with the world of the string instrument. Works like the Sinfonia for Strings, Tides of Mananan and the often performed Violin and Cello concertos are central to his instrumental output. He has lived in Highgate for many years and was highly successful as featured composer at the 2007 Hampstead and Highgate Festival. Patterson was the obvious choice to compose a concerto for virtuoso violist Sarah-Jane Bradley. The Viola Concerto is cast in four short movements; the opening Recitative is a sparsely accompanied viola cadenza which moves directly into a beautiful Aria marked poco adagio, where the accompanying orchestra take a more active role. The skittish Intermezzo ensues, the orchestral strings playing pizzicato for most of this movement. The final Tarantella is a real tour de force for both soloist and orchestra – a short cadenza heralds in the final orchestral tutti. The concerto was commissioned by the Hampstead and Highgate Festival with funding from the John S Cohen Foundation and was first performed at Hampstead Parish Church on 13 May 2009 by Sarah-Jane Bradley (viola) and the Hampstead and Highgate Springfest Orchestra under the direction of George Vass. 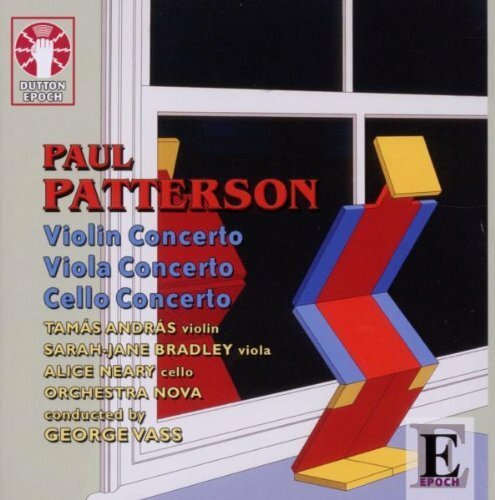 The Viola Concerto has been recorded for the Dutton Epoch label by the same soloist and conductor with Orchestra Nova as part of a CD featuring Patterson’s complete string concertos.